In case you’re not familiar with tiramisu, it is a popular Italian dessert. It is traditionally coffee-flavored, made with ladyfingers dipped in coffee between layers of mascarpone cheese and sugar with chocolate. Tiramisu literally translates as “pick me up”. How perfect is that? Now, lady fingers aren’t generally gluten free unless you search really hard for them and, to be honest, I prefer cupcakes to traditional tiramisu cake. The recipe is fairly straightforward, so don’t let the multiple steps scare you off! You’ll thank me later! Using a whisk, combine cream cheese, powdered sugar, and vanilla extract. Add cream and beat until beaks form. Unless you have crazy strong arms, I’d use a mixer for this step! Add egg whites, egg, and oil. Scoop out the center of the cupcakes. I usually use a knife and cut out a cone shaped center. You can use those fancy gadgets to core cupcakes but this is the easiest way! 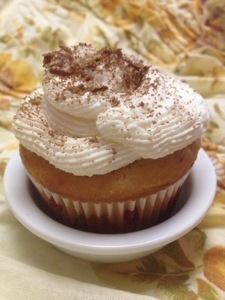 If you want to be fancy, sprinkle cocoa powder over top of cupcakes or use chocolate shavings. You can use a Hershey bar and a knife to make shavings. Best part? You can eat the rest of the bar later! Pasta has always been one of my favorite things to eat. In college, it was my go-to meal for late nights and even now it is a quick meal to prepare. I love heavier sauces and given the time of year, bolognese is one of my favorites! It’s easy to prepare but not something I want to do after working a long shift so I tend to make a pretty large batch. It freezes well so you can easily double to recipe (or triple!) and end up with a stash on hand in your freezer! I use this recipe a lot, especially with my arancini di riso (Italian rice balls- yum!) To make it easier on myself, I use my favorite gluten free sausage instead of regular ground pork. It’s already seasoned. Just make sure if you are using sausage that it is gluten free because some of the casings/fillings have gluten! 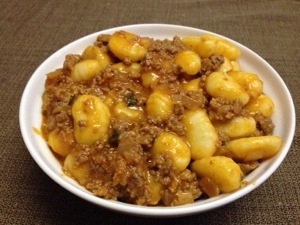 Gnocchi is a pretty great substitute for pasta when you’re looking for something a little heavier. Gnocchi are usually potato based, but flour is added to help bind so you need to make sure that you gnocchi is gluten free if you are going to pick up some at your local grocery store. They are pretty fun to make and you can easily have your kids help you out as well! When I make a batch I usually freeze some for later. For a sauce we usually try some extra virgin olive oil and minced garlic, but my favorite it enjoying it with Bolognese sauce! Delicious! Add egg and knead dough being careful to not over do it! With a slotted spoon, remove gnocchi as they finish and transfer immediately to your sauce. ***Note if you wait for them to finish at the same time you will end up with mushy gnocchi! Do not overcook them! PS- if that’s way too much work for you, here is a list of some already made options that are pretty yummy! I know this recipe is a little late given that it is well into fall and just about wintertime, but I found two spaghetti squash in the corner of my kitchen this morning and decided to whip some up for dinner! Spaghetti squash is a great healthy substitute for pasta- regardless if you are gluten free or not! This recipe is super easy and if you wanna impress you friends, you can easily serve it on a bed of arugula and even add a few cherry tomatoes cut in half! If cheese isn’t quite your thing, you can cook the squash as directed and then add your favorite pasta sauce instead! It works great with a meat sauce or even a marinara! Add garlic and simmer for 1-2 minutes to allow flavors to blend. If you want to make your pasta a bit creamy, you can add the milk and cheese together. A healthier version of potato chips? And delicious? Thats pretty hard to beat! This is one of my go-to snack recipes. Its pretty easy to turn a potato into a yummy treat. Completely gluten free, savory, and filling. That’s a pretty sweet combination. Cut potato into 1/8″ slices. A mandolin is the easiest way to do this. I use mine pretty frequently so if it is not part of your kitchen, you should consider investing in one! Place potato slices, oil, salt, pepper, and cheese in a sealed container and shake shake shake! Chips will keep for 2-3 days but they are so yummy I’ve never had any left over! If you decide to you do not want parmesan chips skip the parmesan cheese and bake as above, or take some chipotle seasoning and sprinkle over chips on the cookie sheets. Tacos are one of my favorite things to eat. 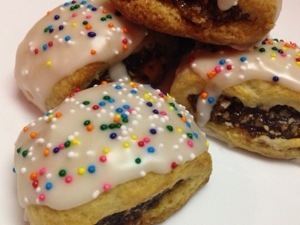 Not only are they delicious, but they are pretty easy to make (or have delivered)! The shell is the only part that can sometimes give celiacs a little scare. Flour tortillas are obviously not an option, but the corn tortillas are usually pretty safe! Just make sure they are not warmed up on the same spot they just heated flour tortillas without wiping it down! My favorite local joint heats up flour on one side of the grill and corn on the other so I never have to worry about it! However, this yummy recipe takes the worry out of the equation by completely eliminating tortillas and replacing them with jalapeno peppers! Now if spice isn’t your thing, you can easily substitute green pepper. For me, jalapenos are the perfect size to increase my veggie to meat ratio. More veggies without sacrificing taste? Score! Add heaping tablespoon of meat to each jalapeno half. You may need to add more or less meat depending on the size of your peppers. 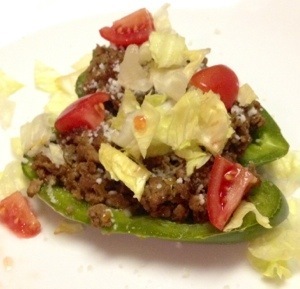 Remove from oven and sprinkle with chopped cherry tomatoes, cotija cheese, lettuce and fresh cilantro. You may also garnish with crushed tortilla chips for an extra crunch and fresh lime juice if you desire! PS- if you make this for your family to enjoy and your kids aren’t fans of peppers, you can mix up all the other ingredients and have them use tortilla chips to eat their meat/veggies! 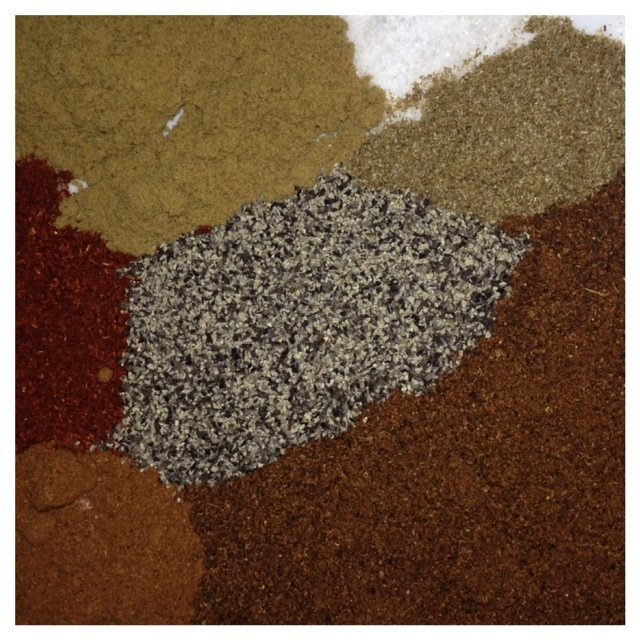 Taco seasoning is one of those staples in my pantry. I used to grab the premixed packages at the grocery store, but they are not always gluten free! To be safe, I make my own with gluten free spices. I always keep some on hand to add to other recipes as well! I usually double the recipe and put it in a shaker that is accessible while I’m cooking. I have found that the best way to NOT feel like I’m on a diet is to use spices to crank up the flavor. Instructions: Mix it up. Yeah. You’re done. Thanksgiving is quickly approaching, though I’m not sure how it got here so soon this year! 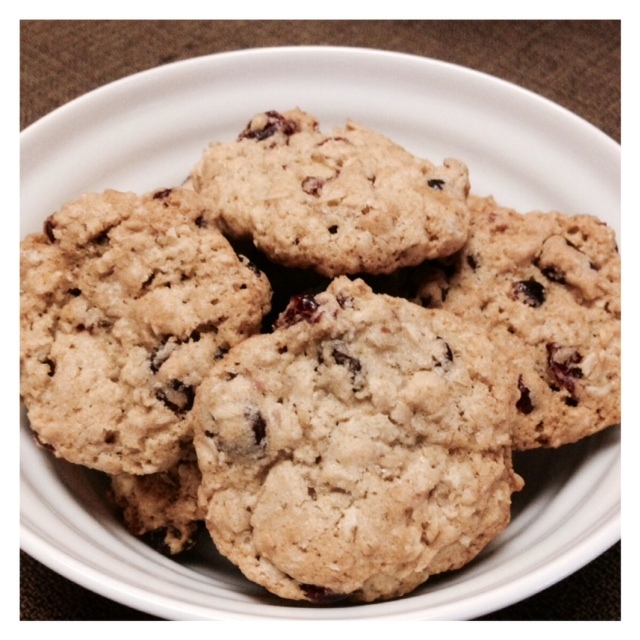 One of my mom’s favorite treats this time of year are my oatmeal cranberry cookies. I missed enjoying them when I first started living gluten free, but I managed to make a few changes to the recipe and found great oats to use and again, my favorite flour to use for holiday baking. Now, if you didn’t already realize that oats can be a problem on a gluten free diet then listen up. Generally speaking- oats are gluten free. The problem comes in their production at the factory- lots of cross contamination! In fact, a story in the Chicago SunTimes a few years ago showed that the gluten levels can be over 900ppm! Gluten free food is generally considered to be under 20ppm so thats pretty insane! There are a few gluten free options on there for oats so feel free to use other brands as well- but just make sure that they are not instant oats since those will not work well in this recipe and you will end up with a crunchy blob instead of a soft yummy oatmeal cookie! Goodbye Halloween! Hello Thanksgiving! Time to make the transition to the next holiday! Now, I am definitely one of those people that absolutely loves this time of year. However, if I am to be perfectly honest, I may love it a little too much and struggled to NOT pull out the Christmas decorations while looking for my Thanksgiving centerpieces. I nearly justified putting up a Christmas tree as long as I didn’t put the ornaments on. Yeah. I’m one of those. You would think I was six instead of thirty-something! So this recipe is a perfect reflection of my holiday dilema! Christmas gingersnap cookies combined with yummy fall pumpkin? Ah-maze-ing! In a medium bowl, whisk together flour, baking soda, spices, and salt. In a large bowl, beat the butter and 1 cup sugar together until smooth. Add the pumpkin, maple syrup, egg, and vanilla extract to the large bowl and mix until well combined. Add dry ingredients to large bowl slowly and mix until combined. Chill dough for 1 hour. If you skip this step your cookies may not be soft and fluffy! Peheat oven to 350° F.
Place small amount of sugar in a small bowl. 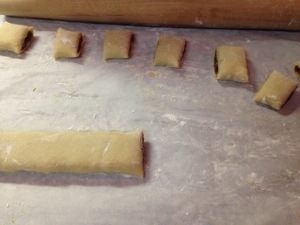 Roll tablespoon-sized balls of dough in sugar until well coated and place on prepared baking sheet, about 2 inches apart. Bake for 10–12 minutes, or until cookies look cracked and set at the edges. Allow the cookies to cool for a 2-3 minutes after removing them from the oven, then transfer to a wire rack to cool completely. They will be soft when you remove them from the oven, but if you allow them to cool before transferring them to the wire rack will alow them to set and firm up just a bit!